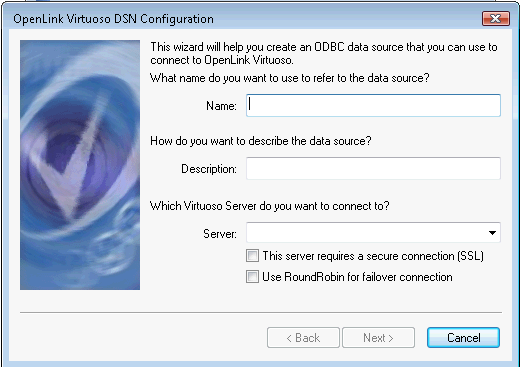 As of Release 6.1, all Virtuoso Data Access Clients (ODBC, JDBC, ADO.Net, OLE DB, Sesame, Jena, and Redland) enable server failover, load-balanced, and fault-tolerant connections. Full fault tolerance is only delivered against shared-nothing Cluster Edition configurations. In each case, where the "Host" or "Server" connect string attribute would previously have held a single hostname and port (e.g., demo.openlinksw.com:1111), a comma-delimited list is now specified. In the most basic fail-over configuration, an attempt is made against each instance in the list, always starting with the first listed, until a successful connection is achieved. If the listed instances are all member nodes in a Cluster Edition deployment, the connections can become fault-tolerant, but this the client application must be written to take advantage of this functionality. Example connect strings for Virtuoso ODBC, JDBC, ADO.Net and OLE DB drivers/providers are provided below. The Sesame and Jena providers make use of the JDBC driver, and the Redland Provider makes use of the ODBC driver, so these do not require their own special connect strings. Or alternatively ensure the "use Round Robin for failover connection" check box in the setup dialog. *  Free Software Foundation; only version 2 of the License, dated June 1991.